The demand within the global vacuum insulated glass market for building and construction has been rising on account of the increasing demand for smart interior designing in the residential sector, finds Transparency Market Research (TMR). The market players in the global vacuum insulated glass market for building and construction have been making constant efforts to manufacture products that offer unprecedented level of satisfaction to the consumers. This quest of the leading vendors in the global vacuum insulated glass market for building and construction has led to stiff competition across the market. The leading market players in the vacuum insulated glass market are neck-and-neck in the race for a greater consumer base. The smaller vendors in the global vacuum insulated glass market for building and construction are lagging behind in terms of attracting a decent consumer base for themselves. The medium-sized players, on the other end, are expected to target the regional and local markets in order to sustain themselves in the market. However, if the leading vendors in the global vacuum insulated glass market for building and construction begin to acquire the small and medium-sized players, the latter is expected to succumb to the market pressure. 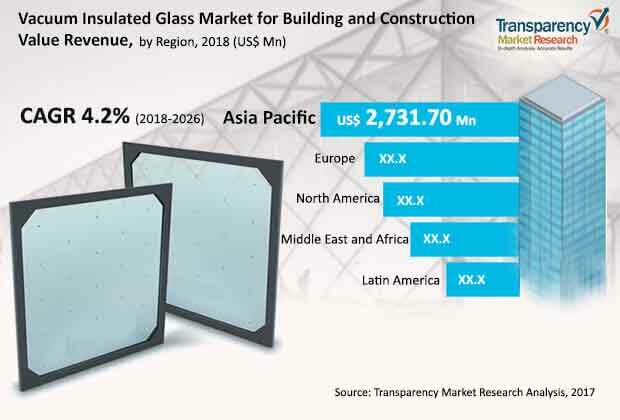 A report by Transparency Market Research (TMR) on the global vacuum insulated glass market for building and construction predicts that this market would expand at a steady CAGR of 4.2% during the period between 2018 and 2026. Furthermore, the report also finds that the global vacuum insulated glass market for building and construction had a net value of US$ 4.5 Bn in 2017. On the basis of end-use sector, the demand for insulated glass has been the highest across the industrial sector. Based on geography, the demand within the market for insulated glass for building and construction has been the highest in North America. The demand within the global vacuum insulated glass market for building and construction is projected to rise on account of the development of smart cities across the world. The increasing volume of carbon emissions across the globe has compelled governments and other international organisations to develop smart energy frameworks. Since insulated glass helps is stable and ambient at room temperature, its deployment could help in reducing carbon emissions on a broad scale. Furthermore, vacuum insulated glass is also a viable source for stabilising the temperature and generating light. Owing to the aforementioned factors, the global vacuum insulated glass market for building and construction is prognosticated to accumulate voluminous revenues in the years to come. Several initiatives to develop smart cities are underway across India, China, and Japan, and this has aided the growth of the vacuum insulated glass market for building and construction in Asia Pacific. Furthermore, the proactive nature of several European countries in developing smart energy frameworks has also propelled market demand in recent times. It is expected that the market for vacuum insulated glass for building and construction in North America would reap the benefits of stringent government regulations with regards to carbon emissions and energy consumption. The review is based on TMR’s report titled “Vacuum Insulated Glass Market for Building & Construction (Application - Roof Lights, Windows, Doors, Roof Glazing, Glass Façade; End use Industry - Residential, Commercial, Industrial) Market - Global Industry Analysis, Size, Share, Growth, Trends, and Forecast 2018 – 2026”.